Shocking a pool kills bacteria, germs and other organisms that can make for an unpleasant swim. Chlorine and bromine are the two most effective shockers, in that order, with bromine causing less eye irritation and releasing fewer odorous fumes than chlorine. When a pool is shocked with bromine, you can hop in 15 minutes later with no adverse effects -- not so with chlorine. Chlorine requires eight hours to dissipate enough for you to take a dip, but it generally costs less than bromine, so some pool owners find it more desirable. You should choose which type of sanitation to use on a regular basis, although chlorine users can occasionally shock with a non-chloride product. There are two ways to shock a pool: dilution and broadcasting. Fill a clean bucket 1/2 full with water. Ensure there is no dirt or dust in the bucket. If the bucket is dirty, rinse it several times before committing to use the water inside. Add 1 lb. of nonchlorine shock to the water. Do not pour granules of shock into the bucket and then add water. Stir the granules into the water with a mixing stick. The handle of a pool net works well to mix the water and the shock. Pick up the bucket and walk around the pool. Pour small amounts of the shock solution into the pool as you walk around. Repeat the mixing and pouring process. Continue until you have used the appropriate amount of shock treatment for your pool as indicated by the manufacturer's instructions. For normal sanitation it is usually recommended to use 1 lb. per 10,000 gallons of water. If the water is cloudy you may use up to 2 lb. per 10,000 gallons of water. Wait 15 minutes before swimming. Open the package containing nonchlorine shock. Generally, nonchlorine shock comes in a large bag. Scoop between 1/2 and 1 lb. of nonchlorine shock into the pool. Do not use more than 1 lb. in one place. As you scoop it into the pool, scatter it so it dissolves faster. Take three steps forward. Scoop between 1/2 lb. and 1 lb. of shock into your pool, using the same method you used with the first scoop. Step forward again, scooping the same amount of nonchlorine shock into the pool. Continue this process until you have used the appropriate amount of shock treatment for your pool as indicated by the manufacturer's instructions. Wait 15 minutes after the shock dissolves before swimming. It generally takes less than five minutes for shock to dissolve. 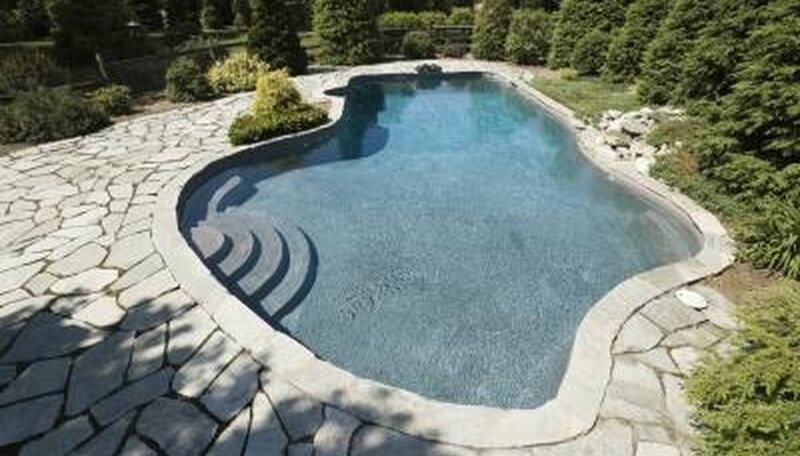 You may use non-chlorine shock to clear your pool because you want to swim without waiting 8 hours even if you normally use chlorine; however, you should return to your normal chlorine shock routine within 24-48 hours.